The Toy Box pack basically adds a load of new... toys to the game. The best part? Toy Box is free. F.R.E.E Free... sort of. See, you get the new level 6 ability (vertical flight), the Keys to the City package of goodies, and the Vehicle Tag mode. But there's new vehicles, weapons, avatar awards, and 'cheevo's to be had here as well. And that'll cost ya' pal- 560mspts to be exact. Full description of all of the above after the break. ...560? Where's they pull that number out of? Cars, ammo, jetpacks and more. These are the things that make you go boom! “Crackdown 2” makes an explosive return with the title’s first Game Add-on, “Toy Box,” available on Xbox LIVE Marketplace starting today. With two content packs that will satisfy every thrill seeker, Microsoft Game Studios and Ruffian Games are rewarding all “Crackdown 2” owners with all-new gameplay experiences at no cost, while fans looking for more action can purchase the premium content for 560 Microsoft Points. 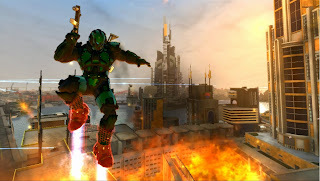 The “Toy Box” Game Add-on kicks the high-flying “Crackdown 2” action into high gear, offering all “Crackdown 2” owning fans the new Vehicle Tag mode, a Level 6 ability reward and the Keys to the City at no cost. For the dedicated action fanatics, “Toy Box” also comes with bonus content that can be purchased for 560 Microsoft Points, including 10 new Achievements, Avatar Awards and new vehicles and gadgets. Catch a sneak peek of the “Toy Box” action in the new gameplay trailer on the Xbox YouTube channel. · Keys to the City: Made notorious in the first “Crackdown” expansion as the ultimate cheat mode, Keys to the City returns to “Crackdown 2” and puts an even bigger set of tools at your disposal, including God Mode, Infinite Ammo, Fly Cam, spawning of weapons, gadgets and more, the ability to freeze the time of day, and pushing all skills to the maximum to become faster, stronger and more lethal. · Level 6 Reward: Fans who reach Level 6 on all Agent skills will be rewarded with the new Thruster Ability. Thruster Ability is like having jetpacks for your boots, giving Agents built-in vertical propulsion to activate flying with the Wingsuit no matter where you are in the game. · Vehicle Tag*: Once you’re done taking down the Freaks and the Cell, join your friends for a thrilling new multiplayer mode where up to eight Agents can compete in these six arenas: Speed is the Quay, Industrial Action, Maim Street, Skid Row, Beachhead and The Sum of Human Knowledge. · Two New Vehicles*: Access two new vehicles: the wall climbing aquatic mini-tank called the Agency ATV, and the Squad Chopper, which allows four players to jump in and man their own weapon, including the proximity mine launcher, precision rocket launcher, twin machine guns and nose machine gun. · Five New Toys*: Whether you’re soaring to greater heights or orchestrating a massive explosion, get creative with the following new toys: The Mass Driver (turreted gravity bending weapon), Portable Launch Pads (allows Agents to create their own launch pad jumps), Stickler Grenade (bouncing grenade that sets off smaller explosive charges as it bounces), Thrusters (allow vertical thrust), and Mags on Characters (allow Mag Grenades to be attached to characters). · Two Avatar Awards: Deck your Agent in the latest gear. “Toy Box” offers two Avatar Awards to customize your Xbox LIVE Avatar with the Xbox Green Suit (must complete the Rocketeer Achievement) and Green Helmet. *Players who have not purchased the premium “Toy Box” content will only have access to the new vehicles and gadgets during multiplayer games if a friend who has purchased the premium content joins. Downloading “Toy Box” is not required to continue engaging in other multiplayer gameplay modes with those who have downloaded it.